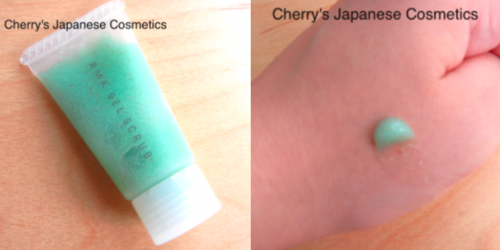 In this summer, I (Cherry) was looking for sunscreen, makeup remover, and scrub wash. But I had not updated about scrub washes. First is RMK Gel Scrub, as one of the girl’s recommend. This is a mini size sample. You will see the green paste on my hand. I wish you can see there are some white and brown scrub grains. When I massaged softly, the white scrubs are gone, but brown are still left. I am sure that these brown might be peach seeds. Actually I liked the texture of this gel, it is not including mints and there are no pain on my skin. The perfume is designed as kiwi, it is not strong, and just refreshed me. I am pretty happy I can refresh my summer skin. Just for your information, do not use those scrub washes so many times per a week. I use them once a week. There is one, but huge problem. Why it is green? I know it is designed as kiwi, but it is quite wired for myself to applying this color on my face. I know it is just a color, and less effect on my skin. If you are a person, who does not feel like me about this color, I recommend it to try worth. I say again, this scrub is great as a scrub wash itself. Please check the latest price, and order from here; “RMK Gel Scrub“.